There are certain books that warrant little more in a review than a pure and simple statement: "Trust me. Read this." The Alienist is one of those books. Trust me. Read it. If you need more than that, read on. Set in New York City in 1896, The Alienist centers on the hunt for the murderer of several young child prostitutes. Theodore Roosevelt, then of the NYPD and not yet of the politics, assemables a ragtag group of "detectives" for the case, which has been cast aside by the NYPD proper. And so we find ourselves following a psychiatrist, a journalist, a woman, and two Jews on a quest to solve a rash of child killings that no one seems to give a damn about. They may be a ragtag group, but they are a smart group, and through their eyes, Carr takes us back to the very early days of crime-solving, before fingerprints are admissible in court, before forensics exist outside of a small realm of ostracized doctors, and before psychiatry played a role in any murder investigation. We take these things for granted now, with CSI and NCIS and SVU and Bones and Criminal Minds and the like, and a walk down the path of what used to be is at one enlightening and haunting. The Alienist marked Caleb Carr's first foray into fiction, and so entrenched was he in his role as a non-fiction author that he pitched it to both his agent and publisher as a non-fiction title. The mere fact that he managed to pull off such a stunt is evident on each and every page of the gripping suspense he's written there. His characters ooze authenticity, their actions reek of history and the city of New York persists in the realism of well-researched facts. I have always loved a good mystery, and the heart-pounding, sweaty-palmed, furious page turning that goes with it. The Alienist proves the best kind of mystery to be had, one whose elegant prose forces readers to slow down as the plot forces reader to move faster. Couple such dueling motivations with the kind of historical detail that has me constantly wishing for an encyclopedia, and I'm sold. I can only hope you might be too. And let me just repeat: Trust me. Read it. Many, many thanks to Emily for both the recommendation of the book, and my very own copy of it to boot. Sounds amazing! I'll have to add it to my TBR. What a beautifully written review, as usual. I'm tempted to read it all over again! I always feel like I can trust any book you recommend to me, and I can only hope the feeling is mutual. Love you! I absolutely loved this book! And I agree that the research really made the authentic feel. He incorporated it all seamlessly. I didn't much like the follow-up though. I wonder if I would have liked it more if I'd read it first. Alienist is a hard book to follow. I think any sequel might have felt flat. Thank you for a very well written review. New to me both the author and the book. I read this a few years ago and it was one of those books that just grips you. There is a sequel which is good but not quite as good as this. 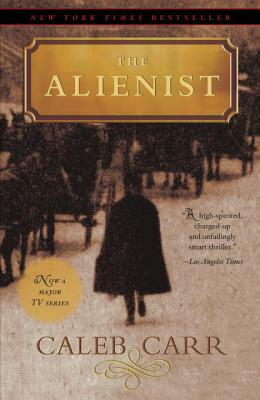 I just finished The Alienist today, and I completely agree -- it's a must-read.